randi Chastain can describe the greatest goal of her life in amazing detail. It was a perfectly struck left-footed shot into the upper corner. You may think you’ve heard this story 1,000 times in the last decade and a half, but you haven’t. More on it later. First we are going to tell you about the most significant goal in Chastain’s career. And, no, it’s not the one you were just thinking about, either. 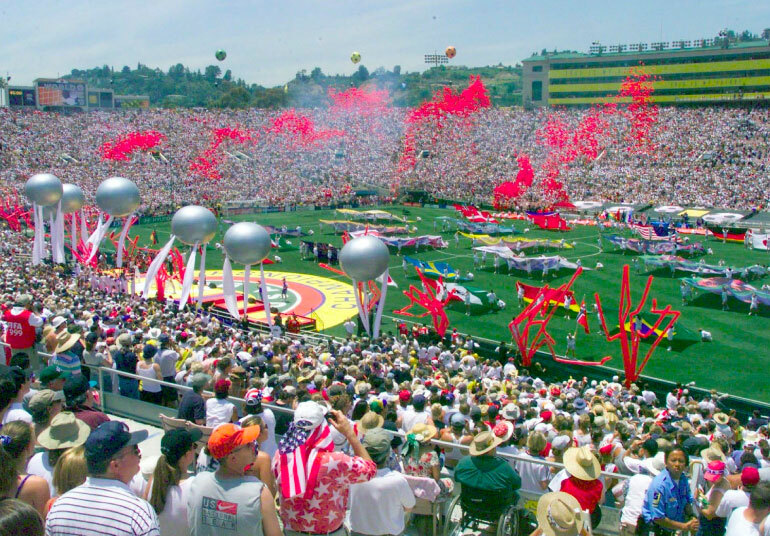 Not the left-footed penalty kick at the sold-out Rose Bowl that decided the final of the 1999 Women’s World Cup. Not the goal that spurred the most memorable goal celebration in U.S. soccer history. Not the goal that capped an event that changed the perception of women’s sports. Chastain’s most important goal is one that’s known as either “the redemption goal” or Chastain’s “second goal” against Germany in the World Cup quarterfinal. The “first goal” Chastain scored in that game happened to be an own goal in the fifth minute, putting the U.S. in an early hole. The second goal came just after halftime and tied the score 2-2. Chastain’s celebration said it all. She threw her head back and fell down on her backside as if she was about to make a snow angel. She then covered her face with her hands. Chastain, the biggest “soccer junkie” on the U.S. squad, well knew the significance of both her own goal against Germany and her subsequent second-half equalizer, and after the later she took a moment to flat-out soak up the sense of relief. Always known among her teammates as the squad’s biggest soccer junkie, Chastain admits that she’s thrilled to discuss that goal, and proud of its place on SI.com’s list. 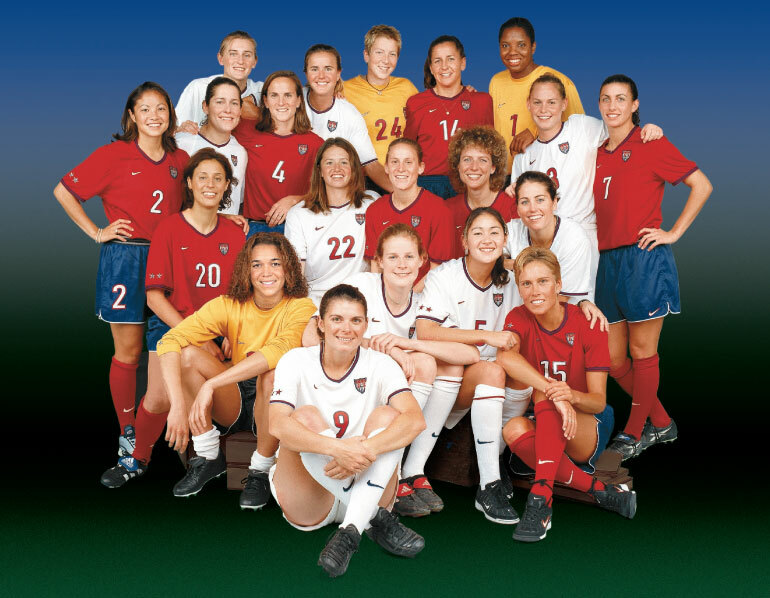 Smiling here in this group portrait, the 1999 U.S. women’s World Cup team felt the crushing weight of expecatations. For the ’99ers, playing in front of adoring home-country crowds, nothing short of the championship would be acceptable. The goal, in many ways, is symbolic of the team—the ‘99ers, as they are now known. It was a team that, as the years have passed, has admitted to the pressure it felt to win. Just reaching the final, or putting on a good performance, wasn’t going to work in ’99. The U.S. turned doubters into believers from the outset, playing before one packed house after another and getting the full-blown rock star treatment. It seemed the entire country had shut down to watch. Not with packed football stadiums full of adoring American fans there to celebrate. This is a team that had to deliver a title, which is why Chastain’s decisive penalty kick in the shootout against China in the final will always be her signature moment as a player. For a variety of reasons, when compiling this list, penalties taken in shootouts were ruled out. 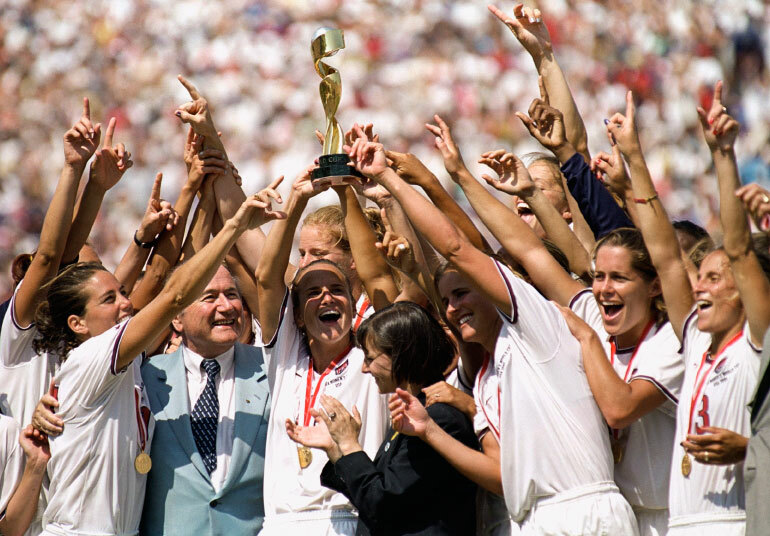 But a goal with a link to Chastain’s PK and the U.S. team’s victory in the ‘99 World Cup final made perfect sense. The final was so many things, literally and figuratively. The organizers of the event took a leap of faith when they decided to play the matches in the country’s largest stadiums. There were many skeptics. The U.S. turned doubters into believers from the outset, playing before one packed house after another and getting full-blown rock star treatment along the way. Fans, male and female, showed up face-painted, wearing the jerseys of players like Mia Hamm, Michelle Akers and Kristine Lilly. But with the adoration came the crushing weight of expectations. By the time the Blue Angels flew over the Rose Bowl before the U.S. and China kicked off, it seemed the entire country had shut down to watch. An official total of 90,185 fans filled the Rose Bowl for the final match between the U.S. and China, the largest crowd ever for a women’s sporting event. Those attributes carried the U.S. for 120 minutes at the Rose Bowl against a talented and disciplined Chinese team. Chances were few and far between during regulation time, but every errant pass and less-than-perfect touch on the ball felt like it could be the game’s defining moment. A classic final in that regard, with neither side giving the other an inch. The most memorable play from the game came late in extra time, when Lilly, stationed on the goal line, cleared away a header that had beaten goalkeeper Brianna Scurry. The scenes on the sideline before the penalties were taken captured the moment. Exhausted American players getting treated for dehydration—Akers had already been removed from the game with a head injury—while also imploring one another to finish the job, even though PKs are really just a cruel lottery. The first four U.S. shooters—Carla Overbeck, Joy Fawcett, Lilly and Hamm—all converted, while Scurry turned away China’s third attempt. That was the build-up to Chastain’s moment. Dellacamera paused and watched before saying just one word. Chastain’s penalty kick gave the U.S. the Cup, and her ferocious celebration gave the world an iconic image for the new power of women’s sports. When all the celebrations were over, the story emerged about how DiCicco told Chastain, a right-footed player, that she would be taking penalties only with her weaker left. The coach felt she was more accurate with her left. The other story that came out later was that Julie Foudy was originally slotted to be the fifth shooter, but DiCicco made a last-second switch in the order. Historic in so many ways. Yet, maybe it doesn’t happen without the goal against Germany. Certainly not the type of team you’d want to spot a goal in the fifth minute, but that’s what happened when Chastain and goalkeeper Scurry failed to communicate. With Scurry running off her line, Chastain played what she thought to be an innocuous back-pass to her keeper. As soon as the ball left Chastain’s right foot, she sensed the error, taking a few hard steps to try and chase the ball, only to realize it was too late. In the fifth minute of the U.S.’s quarterfinal match against Germany, miscommunication allowed a back pass from Chastain (right) to roll past Scurry. The own goal left the Americans down 1-0, but far from discouraged. And play on she did, through a thrilling first half that saw the Americans equalize on goal by Tiffeny Milbrett in the 16th minute, but fall behind just before the half. Coaches often preach that games are often decided in the minutes that begin and end each half. This particular game was proving that theory correct. In the first 45 minutes you had an early goal and a late goal by the Germans. At the start of the second half, it was the American’s turn. Just four minutes after the interval, the U.S. had a corner kick. The ball was played to the back post where a German defender inadvertently headed the ball into the center of the box, about eight yards out. Chastain, who had made a run to the near post, peeled back toward the center of the box and was able to catch the ball perfectly on the short hop with the inside of her right foot, falling to her knee after contact. The ball caromed off the inside of the right post and over the line, though it never hit the net. Four minutes into the second half, a U.S. corner kick was headed by a German player into the center of the box, where Chastain played the ball on the short hop and sent it off the right post and across the goal line. 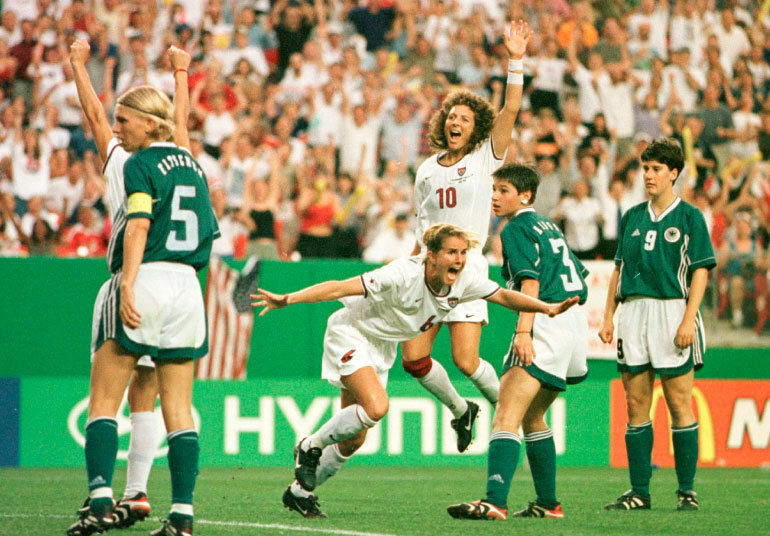 As Akers (10) leapt in joy, Chastain spread her arms as if to grab the moment. The U.S. would take its first lead in the 66th minute when Joy Fawcett scored on a glancing header off yet another corner kick. Seven minutes later, Chastain was subbed out, and watched from the bench as the U.S. held on and advanced to the semifinal. A week and a half later, the defender from Northern California was known the world over for scoring the decisive penalty in a shootout, as the U.S. defeated China to win it all. The captain’s message to Chastain was never, “You’re going to score the goal,” but “We are going to score the goal.” Still, for the ’99ers, the importance of Chastain’s second goal against Germany, her redemption goal, is not lost. Not even for a second. They were the ones: As team captain Carla Overbeck hoisted the tournament trophy, her U.S. teammates—gold medals secure around their necks and the Pasadena sun gold on their faces—let the world know just how things stood in women’s soccer. The goal scored by Germany just before the half was the final goal the U.S. would allow in the tournament. They not only stared down potential elimination and survived, they turned that halftime deficit and the ensuing 45 minutes into a galvanizing moment. The captain’s message to Chastain was never, “You’re going to score the goal,” but, “We are going to score the goal.” Still, for the ’99ers, the importance of Chastain’s redemption goal is not lost. Not even for a second. “It showed what our team was all about. Big players who accepted big challenges,” Chastain says. “We spent so much time working on our game together, as individuals, watching film, having meetings, it wasn’t haphazard. There was respect and trust that someone would always step up and do the job. Think about Kristine Lilly inside the post, saving the ball off the line as the ball went past Brianna in overtime of the final against China. If she hadn’t done that job, the story of this goal, or our team is not written. She will never be forgotten for the penalty kick that sent almost 100,000 fans into delirium. And while most fans remember that as the moment when Chastain was asked to step up and deliver for her team. That moment doesn’t happen without the redemption goal. One of the most significant goals in U.S. history, but not Chastain’s favorite. “My personal favorite was a left-footed volley I scored in an under-12 game,” Chastain says. “It was my team, the Blossom Valley Horizon versus the San Jose Rovers. The Rovers were our neighbors and our nemesis. The ball came out to me at the top of the box and I just unleashed this beast of a left-footed volley. As beastly as any shot that could be delivered by an 11-year old girl. It smashed into the back of the net and I just remember that goal. And, I guess, like that goal against Germany, it just felt easy. Just like the goal against Germany. The second goal. The redemption goal. “Technically, a great goal,” in the words of U.S. women’s coach Tony DiCicco, Chastain’s score—given what had come before and all that would come after—was far more than that.